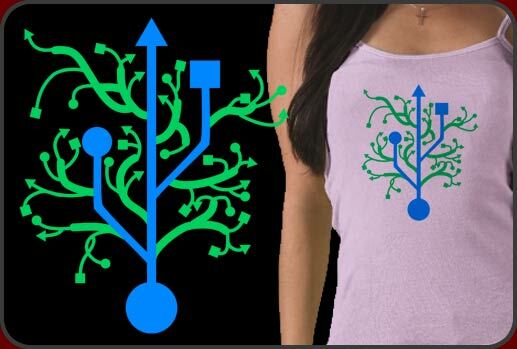 Our USB Shirt features a cool USB tree icon and appears to be sprouting branches. USB shirt featuring a beautiful design of a USB icon sprouting branches. The USB icon is recognized the world over as the ultimate connectivity symbol as it's on almost every electronic device made today. Our USB shirt design was created with that idea in mind. This is one of our newest designs in our geek t-shirt line and we really love the great feedback on our USB shirt design we are getting. The USB shirt prints great on almost any color. We love the USB shirt in black or white though. The USB shirt makes a great addition to any geeky wardrobe. We have USB Shirts available for men women and children too with lots of hot styles and colors to choose from. Check out our hot USB Tree baby doll tees and comfy all cotton mens shirts too. Oh! And there's also great USB Tree designs available on mugs and fun stickers and buttons as well!